Bishops find problems in Colombia, Peru, echo issues at home in U.S.
Bishop Gerald F. Kicanas of Tucson, Ariz., chairman of the board of Catholic Relief Services, listens to Kechwa leader Walter Sangama explain communities' land-rights conflicts in Lamas, Peru, June 27. LAMAS, Peru (CNS) — Conflicts over natural resources and land rights in places like Peru and Colombia echo similar problems in the United States, said U.S. bishops who visited the two countries in late June. “We came to express solidarity with the church in Peru and Colombia, that we are one family in Christ, and the concerns of one part of the family are the concerns of the other,” Bishop Gerald F. Kicanas of Tucson, Ariz., told Catholic News Service. He said the bishops also wanted “to understand more clearly the challenges of the church in Peru and Colombia,” so they could talk about those issues with U.S. Catholics and government officials. The group also included Bishop Richard E. Pates of Des Moines, Iowa; Auxiliary Bishop Octavio Cisneros of Brooklyn; Carolyn Woo, president and chief executive officer of the U.S. bishops’ Catholic Relief Services; and staff members from CRS and the bishops’ conference. Before traveling to Peru, they spent two days in Colombia, meeting with bishops, members of the Catholic Church’s social ministry and U.S. Embassy officials, and visiting Ciudad Bolivar, a sprawling low-income district on the south side of Bogota, the Colombian capital. 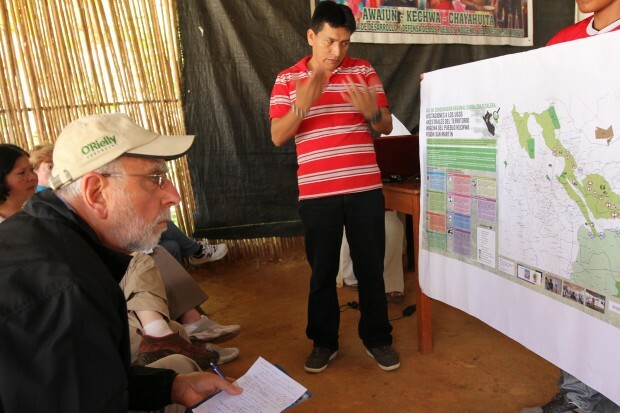 In Peru, they spent a day in an Amazonian indigenous community and met with church officials and members of organizations with which CRS works. In both countries, some discussion focused on conflicts between communities and extractive industries such as mining, Bishop Pates said. Minerals account for more than 60 percent of Peru’s exports and are a growing share of Colombia’s economy, but environmental issues and other problems often cause friction with local communities. Church workers and communities “are addressing (the problems), but now they need to enter into more direct dialogue with the governments and the corporations that are involved,” said Bishop Pates, chairman of the U.S. bishops’ Committee on International Justice and Peace. In Bogota, the bishops also received a briefing on the peace talks underway between the Colombian government and the Revolutionary Armed Forces of Colombia in an effort to end a decades-long armed conflict that has displaced more than 3.5 million people, according to official government figures. Because of its credibility, “the church is seen as a mediator” and plays a role in “trying to shape the discussion in such a way that there is achievement of peace,” Bishop Pates said. “CRS has a great deal of experience in peacebuilding here in Latin America and in other areas, so that needs to remain an important theme” for the organization as it plans for the future, said Bishop Kicanas, president of the CRS board of directors. In Peru, Bishop Kicanas saw parallels between the struggles of Kechwa Indians in the Amazonian community of Lamas and Native Americans in his home diocese. The Kechwa are trying to assert their land rights as oil leases, conservation areas, chicken and pig farms, loggers, settlers and oil palm plantations encroach on their communities in the hills near Tarapoto, the capital of the tropical San Martin region. Over the past several years, through a program sponsored by CRS and the Peruvian church, the communities have developed skills for monitoring environmental problems and negotiating with government officials. Before they approached government officials, the people mapped their community boundaries with assistance from the church-sponsored program. That map became a powerful tool, Sangama said. Although all the problems have not been resolved, the communities now have information for negotiating on more equal footing with government officials. Several communities are in the process of obtaining title to their land, he said. He said he was impressed by the community leaders who gathered under a traditional, thatch-roofed shelter to explain their problems to the visitors, especially Mariluz Quispecachique, who described how the program had helped women gain a greater role in community decisions. “In the past, we weren’t informed about things,” said Quispecachique, who has served as women’s coordinator in her community for the past two years. “Now we work hand in hand with the apus,” or community leaders, who are usually men. After she spoke, Bishop Kicanas said he was encouraged by “seeing how people are empowered to have a voice and impact their community” with the church’s help.